Sure, you can buy your Michael Vick chew toys and Ron Mexico T-shirts and Ookie jerseys, but don't you want a real part of Vick history? Considering he's not likely to play in the NFL again — no, he'll totally turn into an accurate passer when he's back in 2010 — don't you want something truly connected to Vick? We know you do. Therefore, you can now buy Vick's old fishing boat. Only 20,000 smackaroons! 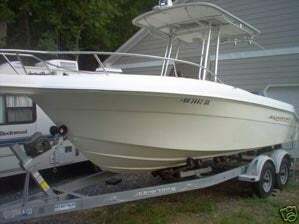 You are bidding on a 2002 Aquasport 205cc Osprey fishing boat owned by MICHAEL VICK. The boat is 22 feet in length, 8 and a half feet in width and is powered by a Yamaha 150. Comes complete with GPS System, Marine Radio and numerous fishing pole holders, coolers and live wells. It can carry as many 8 adults and has the ability to pull water skis and wake boards. This package includes EZ Loader Galvinized Trailer with Power Winch and Certificate of Title signed by MICHAEL VICK as pictured. Man, can you imagine what he did to those fish? Is it possible to get fish to fight each other? Oh, here's how to deal with the guilty plea.